A friend was visiting on a sunny, frigidly cold winter’s day when most people would have preferred to stay indoors and keep warm. Not us. We hopped on a bus that dropped us in Bagnoregio, then hiked up to the footbridge to the top of Civita’. Civita’ di Bagnoregio (“the dying town”) is located 145km north of Rome in the region of Lazio, overlooking the Tiber Valley. The village seems to float above the earth in a cloud, but has the unfortunate distinction of being one of the world’s most endangered places; the town is slowly crumbling and sliding down its cliffs. This little borgo has always had a strange allure for me (as it has, I’m sure, for millions of others who have experienced visited). The atmosphere that day was a little eerie because there didn’t appear to be any other souls in town (except two ambling cats in the main square). It’s a favorite stop of tourists in the spring and summer, but on this February afternoon, the streets were quiet and deserted; underscoring the heartbreaking reality of the city’s inevitability. 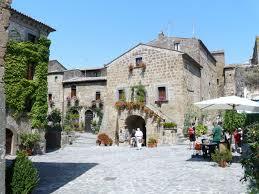 I’ve visited Civita’ three times in my life. The first was as a tourist. The second was as a dinner guest at the home of a friend (which was pretty amazing considering there are only a dozen residents remaining in this little hamlet). My last visit was by far the most memorable. A small sign hanging in a courtyard is the only indication that there’s a thriving business inside a grotta at the end of the enchanting patio. Bruschetteria L’Antico Frantoio is too tiny to be called a cafe’, and the menu is too limited to be a restaurant – so it’s simply called a “bruschetteria”. I imagine it’s like no other bruschetteria in Italy. The Rocchi family has been operating this iconic destination of travelers for decades with its 1500 year-old olive oil mill (frantoio) in the back. The mill, which still functions (although it’s retired) has been in the family since 1520. Today, the family’s Agriturismo “Le Corone” in a valley nearby produces all of its oil. On this day, Felice Rocchi was our host and chef. A remarkably efficient use of space, there is only a fireplace to grill the bread, a counter to assemble and serve the bruschetta and wine, and a few tables covered in tablecloths. I think we were Felice’s only customers that day and since we were in no hurry to return into the freezing wind, the three of us passed a very pleasant afternoon talking and eating the most amazing olive oil-soaked bruschetta and drinking the freshest house red wine. We chatted about Felice’s family, got a private tour of the Etruscan well in the cantina, and together devised a kooky plan to help bewildered Jtourists how and what to order. He promised us a cut of the projected profits from our little scheme, but I think when I return, I’ll ask for my share to be paid in bruschetta. Thank you for the article, I’ve never heard of a BRUSCHETTERIA before, I really like the concept of such an establishment. Many times a couple of spuntini (snacks) and the chance to leave the house are all I want; two or three bruschette, a glass of wine or beer and a couple hours of conversation would prove heaven-sent. Wonderful photos, grazie. This story took me right back to that chilly day full of delicious Bruschetta and outstanding homemade wine in the dimly lit warm cave. I remember, after a while, I started to actually understand Italian! I just read through your many articles in here and feel like I spent the last hour with some very interesting people in Italy! I love that you are following your passion (or as you put it your obsession) and I know you will soon realize your dream of living in that beautiful medieval town on the rock. Ciao Toni. Another great article, how do you it?, I live here, yet you seem to be able to find all these little treasures!! !.Oh I know Civita well enough being only 20minuets away, but never found that Brushetatera (must keep my eyes open in future!! ).Civita really is a little gem of a place, I love to go in the Autumn or as you would say Fall! !, when, as the photo depicts, it appears to be floating in the clouds and it is so peacfull,.such a shame that one day it will not be inhabited,due to it’s demise. In the above comment you said you were so lonlely, have you any dates for your return?if so, if you get lonely again we could possibly meet for lunch?.or even if you are not?.take care…..Brian. It is sad when a little family-owned enterprise cannot keep up with “progress”. May I have permission to paint any of the pictures on this post? I am so attracted to Italian places, and would appreciate your reply. Sorry Toni, it’s Brian again! I have been looking through some of my mails and found something that may be of interest to you and your readers.Why do I have a sneaking suspicion you may know this Lady?. Well the site is known as Elegant Etruria, written by one of your country folk, an American Irish Lady by the name of Mary Jane Cryan, she has lived in Italy for many years and has written many books on Italian history and places to visit. She is such a friendly person and always open to chat,so may be you can check it out. regards, again. Brian. Dear all, I just wanted to let everybody know that the Bruschetteria Antico Frantoio is still OPEN and serving traditional bruschetta and vino as usual! The place has been closed for a few months for refurbishment and it’s now up and running. 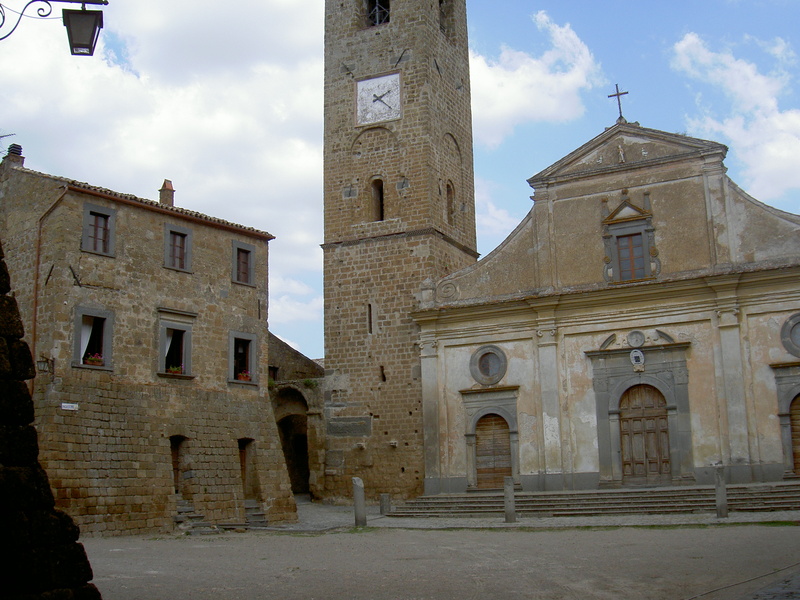 The Antico Frantoio is a unique place of its kind and we are aware that it would be a pity for many visitors to miss out on such a magical experience: tasting local wine and olive oil while admiring the old olive oil mill from the XVIth century. I’m Felice Rocchi’s daugther, Cinzia. The place is stil managed by my brother Fabrizio Rocchi, the owner of the farm and agritourism “Le Corone”, located in the valley below Civita, “The Calanchi”, where the delicious olive oil is still being produced. While wishing all the best to Maurizio and their new opening restaurant, we warmly invite you to visit the Antico Frantoio. Kind Regards, Cinzia Rocchi. This reminds me of when my professor in Italy, arranged for us to visit a frantoio outside Perugia. We got to learn about the olive oil making process from field to press, and back again. 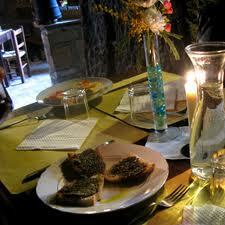 We were offered golden soaked toast with that wonderfully peppery, “appiccicoso” olive oil. Despite it’s simplicity, it was its own meal, and its own experience. Nothing needed to come before or after. We were connected to the Earth through the process and consumation of winter olive oil.